Oroville Dam – The Main Spillway Is Failing – Coercion Code – "Dark Times are upon us"
The failure of the main spillway is now INEVITABLE! It will eventually fail, all the way from the sidewall breach, the one between/below the power lines, and the top of the spillway. The erosion undercut going back up towards the spillway top, on the left side first, a day or so ago, and IT IS LIKELY CUTTING UNDER THE ENTIRE WIDTH OF THE MAIN SPILLWAY AND WILL LIKE CAUSE A SEPARATE BREACH ON THE RIGHT SIDE OF THE SPILLWAY WALL. The whore media and politicians will spin this as best as they can, but we are going to see criminal charges out of this down the road. The failure to issue a mandatory evacuation order is an act of moral cowardice, cynical political opportunism and will destroy California for a generation. Nowski, amigo I am saying the state of Jefferson is going to be born out of this, since the hatred of the deplorables for that GOVERNOR MOONBEAM (BROWN) HAS DONE TO THEM WILL HAVE NO LIMIT. The main highway/freeway is I-5 and over it comes the tens of thousands of trucks that supply the “I-5 Corridor.” The rail lines are also linked to the I-5 corridor and carry every thing the entire coastal PNW, Portland, Seattle need. You do have options, 101 Coastal Highway, 395 through Eastern Oregon, but they are not credible for mass truck transit. In my opinion, the level of economic damage to the Agriculture Industry will be massive. It is not a case where you “can’t” get citrus fruit, or fresh vegetables, it will be a case of it will cost you more to import citrus from Florida, Texas or Arizona. And I will say again to those of you who somehow think Governor Moonbeam is going to skate on this, especially if San Francisco Bay is full of floating corpses, it ain’t going to happen. The way the game works is the media and political whores get to do whatever they want until they screw up so bad people die. At that point, the larger system, the NWO , the globalists are quite willing to throw a mid level player like Governor Moonbeam to the howling wolves, if it will keep their butts out of the wolf pit. Nope, Moonbeam is road kill because the real “they” the 300 families that rule the world, won’t hesitate to slit his throat to keep the mob happy. I live with Snowflakes, Nowski and when the Snowflakes lose one third, to one half of their drinking water, they are going to chop Moonbeam into tiny pieces. Jerry Brown, is the Benedict Arnold of his generation. First he leads an unconstitutional effort to lead California out of the US through CALEXIT. Then he acts with depraved indifference towards the 2 million people living between the Oroville Dam and Sacramento. Brown has 25 billion dollars to spend on programs benefitting illegal aliens, but he has no money to spend on a dam that had identified very serious issues as long 12 years ago. Brown has the money to open a CALEXIT embassy in Russia, but has no money to evacuate 2 million people in harms way, even as a precaution. Why is Brown avoiding the media? Why did Brown’s Department of Water Services rescind the original evacuation order, yet offer no evidence as to why this was done? Why hasn’t Brown offered help and provide money to faciliate repairs on the levees in S. Sacramento that have already led to some evacuations? Should there be a sense of urgency with “5-7 inches of rain” being forecasted in the next 48 hours for the Oroville area by the National Weather Service? Why isn’t the silent Governor-in-hiding, Jerry Brown, who has seized control of the situation as well as the media press releases, paying at least some attention to the National Weather Service forecast and issuing his own risk assessment statements in conjunction with the weather report and then moving to protect the potential victims? With 2 million lives at risk, it is surprising that the National Weather Service (NWS) would not make this the LEAD STORY, especially since they acknowledge that they are “concerned” about the Oroville Dam, but presented this concern, as the readers just witnessed, as an after-thought. Regardless, of where the NWS placed this weather report in their broadcast, shouldn’t this be enough evidence that the region should be evacuated as a precaution? (Author’s note: Please note that the recorded forecast will undoubtedly update – however, I don’t see the situation changing as originally reported by the NWS). In light of the attention that the Oroville Dam sitaution has brought into the public view, several other dams in Northern California are at risk as well. The most prominent dam that could be joining the Oroville Dam on the endangered list is Mt. Shasta. According to the Sacramento Bee, the state’s largest reservoir, Lake Shasta, is also approaching its capacity. Lake Shasta has reached a very dangerous level of 95% of capacity and is presently releasing maximum water outflows just prior to the present series of storms which are ripping through the area. Subsequently, this situation is out of control and virtually, the entire Northern region of California is in grave danger. If the Oroville Dam fails, it is open season on Sacramento. And with the already failed levees and present level of flooding, the results would be catastrophic. If the Shasta Dam fails, the I-5 Corridor will cease to exist. 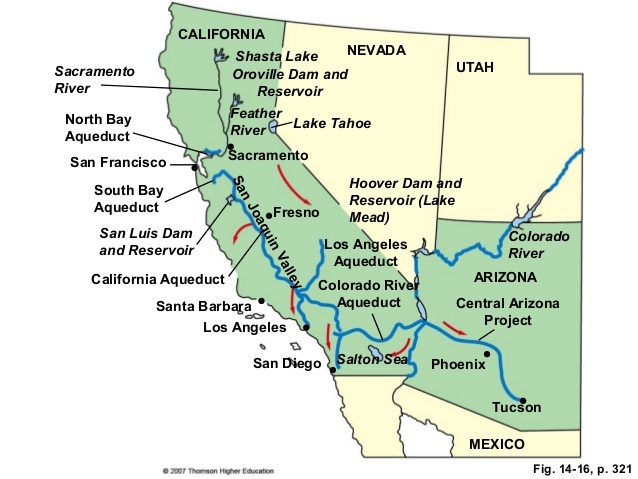 For future reference, please note that the Shasta Dam, among other rivers, flows into the Sacramento River. 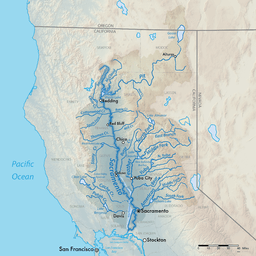 If the Oroville Dam breaks it will wipe out Sacramento. The same is true for Redding if the Shasta Dam fails. The same assessment projected a similar fate for the rest of the Central Valley if the Oroville Dam failed. the rest of the Central Valley would be devastated. How far south will the flood waters go? I am not sure. But I do know that the flood from Shasta and the flood from Oroville, should they occur in the same time frame, would meet in S. Sacramento where the levees are already failing, courtesy of Gov. Brown’s neglect. We will know more by mid-week. Let’s hope Northern California gets a reprieve in the weather forecast and the workers are able to save the Oroville Dam. In case you missed my interview with No Cal radio personality, Paul Preston, you will want to listen as it provides a lot of contextual material for this report.